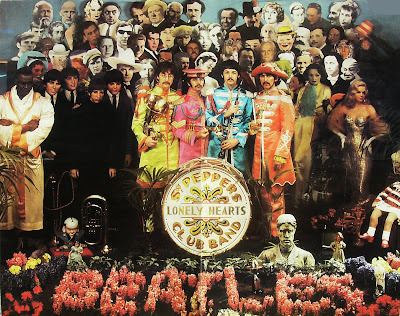 The Daily Beatle: Sgt Pepper: Who is who? 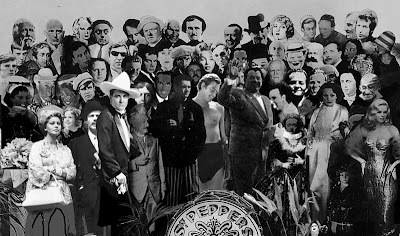 Sgt Pepper: Who is who? 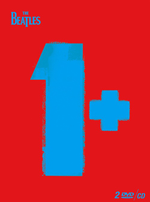 Click the image for a bigger version. 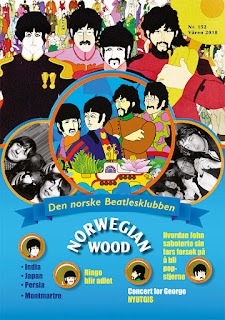 Here's something which I hope will be a good resource for Beatles scholars and students for years to come. 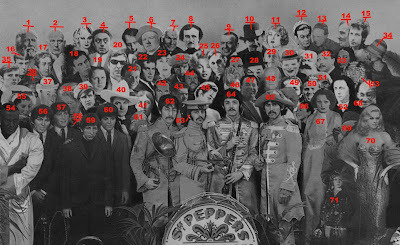 This is a guide to who all the people on the Sergeant Pepper's Lonely Hearts Club Band cover photo are. Every name is linked to the person's own wikipedia entry, so this page will stay current forever. All the links will open in a new window. You can have acres of fun with this post for a long time. Enjoy! 55. THE PETTY GIRL 2. No. 12, Leo Gorcy was on the cover, but he was painted out before publication due to his manager requesting a fee of $400 for his participation. No. 68, Mahatma Gandhi was also painted over, by request of EMI. 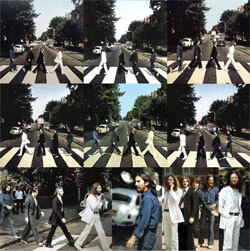 Here's a recreation of how "the stage" looked like before the Beatles and their wax models entered. As you can see, more people are revealed. 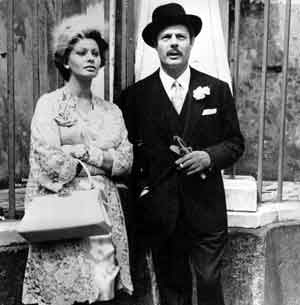 Hidden behind the wax models of The Beatles, you would have seen this image of Sophia Loren (1934- )and Marcello Mastroianni (1924-1996). 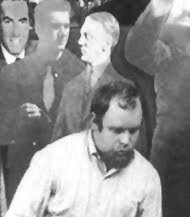 Adolf Hitler (1889-1945) was also one of the full figure cut-outs, but contrary to what Peter Blake later claimed, he was not hidden behind The Beatles, but stood in the wings when the Beatles entered the picture. 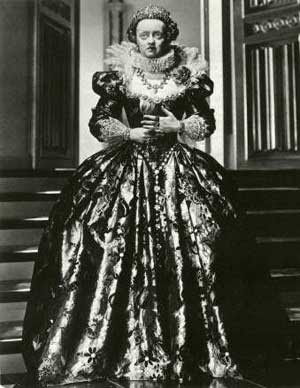 Hidden behind George in his Pepper suit is this image of Bette Davis (1908-1989) in her portrayal of Queen Elizabeth I (1533-1603). Also, an image of Timothy Carey (1929-1994) from Stanley Kubrick's "The Killing" shows up behind George. 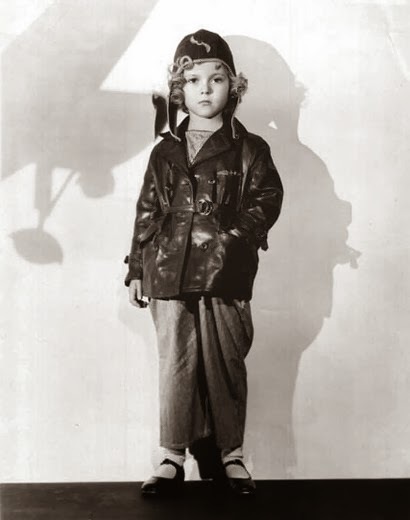 Shirley Temple in a still from the movie "Bright Eyes"
JAMES JOYCE 1882-1941 (a cut-out of his head was made and they tried to fit it in somewhere, but gave up. At one point his head was where Lawrence of Arabia went. 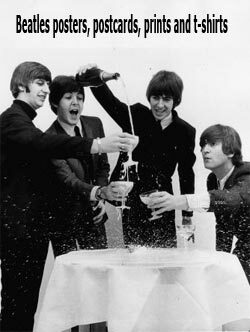 Finishing off, what you see depicted above is a poster from the Pepper photo session. It is pretty close to the one that was used on the album, but you'll notice small, slight differences like John holding his instrument a bit higher. 38. Is NOT Lucille Ball. The Vargas Girl is Anna Mae Clift, Vargas's wife. What happened to the Sgt Pepper suits?